Princesses Beatrice and Eugenie were front row at the Issa show last night as Naomi strutted the catwalk in a surprise finale. The royal sisters both looked elegant in thigh-skimming frock, black tights and skyscraper heels as they arrived for the show at the Natural History Museum. Issa attracted an elegant crowd to her London Fashion Week show, including Emilia Fox, St. Trinians actress Tamsin Egerton, Kate Middleton’s sister Pippa and a whole cast of Olympic athletes, complete with medals. The star spotting was not limited to the front row though. A surprise finale from veteran model Naomi Campbell thrilled both the celebrities and fashion press alike. At the end of the runaway show, Naomi flashed photographers with a signature smolder. Then the catwalk queen reappeared with the designer, Daniela Issa Helayel, and a fellow model, to make a joint bow. According to the look of their outfits, the royal princesses appeared to consider fashion style from this year’s London Fashion Week, in well-considered ensembles worthy of the global style stage. Princess Eugenie, who was recently accused of being somewhat overexposed in a low-cut top recently, played it safe in demure black. Her choice of a classic clutch and patent platforms in muted burgundy, a string of twenties-style beads and festival wristbands appeared to be a reflection of a subtle nod to her youth. 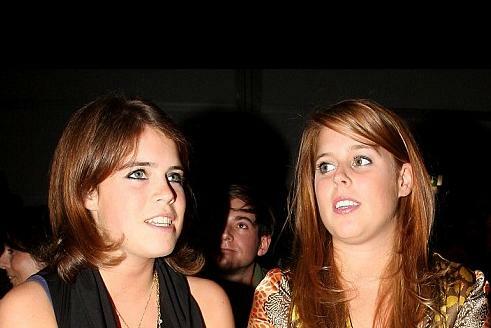 Her older sister Princess Beatrice chose a lively printed dress as she was sporting a black vest with low neckline. The princess matched her outfit with a pair of red-soled Mary Jane shoes by fashionista favorite Christian Louboutin, bang on-trend with platforms and studs.